The Internet Archive has an abundance of resources useful for history teachers, students of pop culture and media studies researchers. The resources are diverse in terms of media type and content. On and off during the last few days I have explored films relating to the assassination of JFK, Cold War propaganda, the dawn of the atomic era and instructional films from the 1940s and 1950s. The archived films, for example, are particularly useful. It is possible to watch the films from within the browser yet links are provided that enable the researcher to download the films in a variety of formats including Cinepak, Ogg Video, MP4, Real Media, MPEG2. Embed code is also provided for the researcher. The embed code did not, however, work with this blog. Not to worry, as I downloaded the films to share with my students anyway. The short films could be utilised to introduce a topic, generate argument, raise questions and act as the focus for a project. Students could download a sequence of short films on a particular topic, Cold War propaganda for example, and remix their own mash-up or documentary based on the material. Two favourites of mine from the archives include a Superman cartoon from 1942 as well as the famous instructional film, Duck and Cover. In The Eleventh Hour Superman is busy destroying ships and military installations in and around Yokohama. He commences his acts of sabotage at 11.00PM each night. 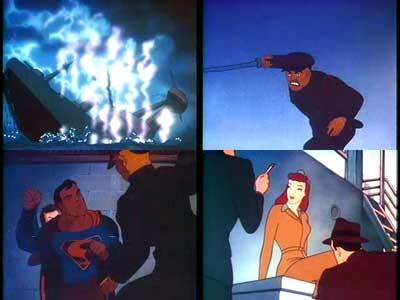 He also rescues Lois Lane who is also present in the city. Why she and Clark Kent are present in Yokohama at that particular time is not so clear. The Japanese foe is depicted in a racially loaded and demeaning manner. As one commentator on the site pointed out it is interesting to see Superman wreaking destruction as opposed to saving the planet. I saved a copy of the film in MP4 format. One can also stop the film at specific moments, right mouse click on that frame, select ‘Copy” and save the individual frame for later embedding in a support document or web site for the students. 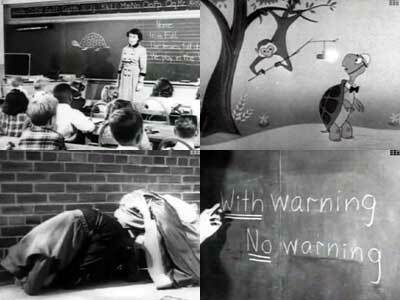 The other, Duck and Cover, is a well known civil defense short film from 1951. Burt the Turtle gives advice on how you and I can survive an atomic attack. Sure, you can survive an atomic blast! Watch it and be amazed at what the general public and students were taught regarding atomic warfare. I usually show the students this film in conjunction with clips illustrating the destruction at Hiroshima and Nagasaki as well as the impact of the underwater atomic test at Bikini Atoll during Operation Crossroads. These are just two of the thousands of films in the Internet Archive. Some are shocking, others simply amusing yet all are informative.